Since we scored a private room for our last night on the Camino, there was no rustling of backpacks to wake us up early. Ergo, we slept until a little after 7 am and finally made our way down for coffee a shortly after 8. Today’s walk to Santiago was a mere 21km, so we planned to be there in about 4 hours. As we left the hamlet and veered off the main road, we were quite surprised by the absence of other hikers. Thankfully there was also an absence of trolls in spots like this. It does make for a good picture, but leaving your boots behind and walking barefoot to Santiago just doesn’t make sense. Well, Mikey thinks that maybe the pilgrim died. Could be. Whatever the case, we absolutely enjoyed the bizarre solitude of the final kilometers into Santiago. Unlike when walking the French Camino (or even the Northern Way since it joins up and shares the same trail for the last two days), there have been almost no crowds. Such solitude is unheard of on the French Way as the majority of pilgrims walking it begin in Sarria – some 100km (and the minimum requirement to receive a Compostela) from Santiago. The end result is a charge in the air and the feeling of a total rat race those last 4 days. Let’s just say that it is less than enjoyable. What we did enjoy was seeing this particular agricultural tableau. A younger woman mows down the field with a modern weed-wacker while an older woman watches by a wooden cart driven by a beast of burden. What might have once taken a week’s worth of work will probably be finished by dusk. Yet, what is the cost of modernization and where are the traditionally male workers? OK – we weren’t judging! We laughed when Mikey turned from taking that last picture and this sheep was just feet away from and looking down on him. Pretty intimidating. Another advantage to entering the city along the Mozárabe or Camino Sanabres is that you can see the cathedral! Conversely, on the French Way, the view is blocked by modern buildings and the last few kilometers pass through rather bleak suburbs. Oh, by this point we had passed only 4 other pilgrims in as many hours. Now, if it sounds like we’re knocking the French Way, please do not think this! Mikey is actually grateful for having walked it as his first Camino. As he puts it, “If I had done either the Northern or Plata as my first, it would have been my last Camino!” Perhaps we use the more widely traveled Camino Frances to become pilgrims before embarking on other paths absent of training wheels. Yeah – that still sounds condescending. Sorry. Well, whatever the path and from wherever the journey begins, all ways lead to Santiago de Compostela and the cathedral at its heart. We dropped our stuff at the hotel – a quaint pension above a tiny bar – and walked a block to the cathedral. Seemingly forever a work in progress, the cathedral shows signs of continued restorative projects. But the Saint remains here. His bones entombed in a silver ossuary, he rests quietly below the altar and deep inside the church to which literally millions have traveled to pay homage. Speaking of science, guess what they call Spanish Mackerel in Spain. (Here’s a hint: it’s kind of like what they call a Mexican standoff in Tijuana.) Yep – it’s just called Mackerel. Tasty, though. Even if you got the last guess right, you’ll never get this one. House-made tiramisu – in a jar! Darn tasty, too. Well, we’ll do a post soon on Santiago. 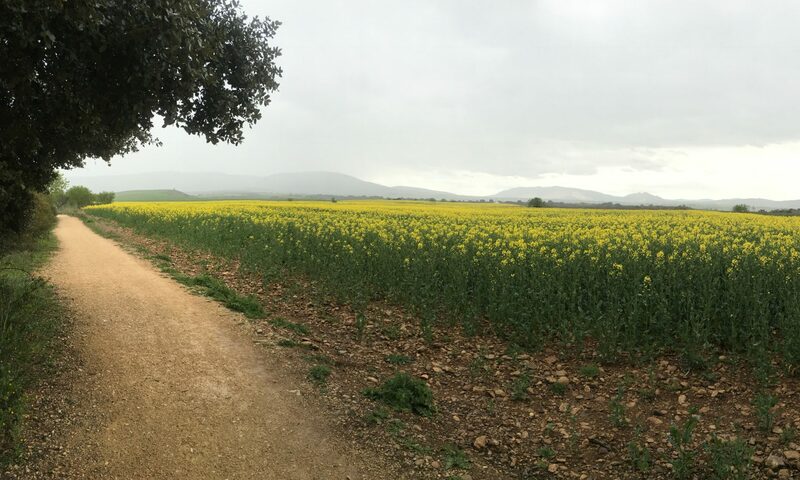 We mostly wanted to get this last Camino post out before getting bogged down on the city’s sights and such. The weather isn’t the greatest, but we’ll see what we can do and promise to take you on a tour of the cathedral. Until then, thanks for hanging in with Mikey and we’ll have a lot of material for you very soon. Saludos.